If you are looking for the best shoes for seniors, consider Velcro shoes. These shoes are easy to wear and pull off since you won’t have to deal with shoelaces. Shoelaces can be a challenge or even dangerous for seniors. This article reviews the best Velcro shoes for the elderly. Below, we have reviewed the top Velcro shoes for seniors and expounded on why they are the best option. Apart from this, you will find out the recommended Velcro shoes in the market based on comfort, quality, and consumer reviews. If you don’t have time to read the whole article but simply want to check the review of the best Velcro shoes for elderly men or women (seniors), scroll down to see the list. However, it’s best if you read the whole article to make an informed buying decision. Velcro is a patented material used as a fastener for bags, clothes, and other items. Velcro shoes are fit with a hook-and-loop (Velcro) instead of a buckle or shoelace. The fastener makes the shoes east to fit. All you need to do is close it up and place its two surfaces against each other to achieve a proper fit. This is why many people prefer Velcro shoes. There are a number of reasons why Velcro shoes are better than those fastened with shoelaces or buckles. To begin, Velcro allows shoes to be worn fast and easily. Apart from this, it is safe for the elderly. Wearing shoes that have shoelaces can be quite dangerous for seniors. Imagine what would happen if the shoelaces make them trip and fall! Shoelaces can get untied during a walk and lead to dangerous falls. On the same note, shoes with buckles can be difficult for seniors to cope with. When a Velcro fastener is secured in place, it will not get undone unless it is pulled out. If the Velcro gets undone for any reason, it will not cause tripping as it will not drag on the ground. Therefore, there is no risk of falling when wearing shoes with a Velcro fastener. This is why the recommended shoes for elderly or seniors are those with Velcro fasteners. Wearing Velcro shoes spares seniors from having to check and re-tie shoelaces. Moreover, the fasteners help prevent accidents such as trips and falls that are common when shoelaces get untied while walking. Color may not seem like an important factor to consider when choosing Velcro shoes for seniors. However, colors can determine how confident a person will be when wearing shoes. Choose a pair of shoes that comes in the colors your senior loves. You do not want to buy new shoes every month or quarter. Therefore, consider the durability of the Velcro shoes for elderly men or women you wish to buy. The best shoes for seniors, especially those with arthritis, are lightweight ones. Shoes with slick soles and high-heels are fashionable. However, the shoes are not comfortable for seniors and can lead to falls. The best shoes for seniors are flat, sturdy ones with footrests. The shoes should also have non-skid soles to provide balance when the senior is walking. Of course, you want shoes that will fit you well. Remember, the feet size changes with age. Wearing the same size of shoes for years can cause foot fractures, which will lead to walking problems. Before buying Velcro shoes for seniors, get the right foot size of the end user. Velcro shoes for elderly women and men come in different brands and models. Choosing the right shoes can be quite a challenge. To save you time, we have searched for the bestselling Velcro shoes for elderly men and women. Below is our review of the top rated choices based on brand trust, durability and customer reviews. This is an ultra-comfortable Velcro sneaker for elderly men that love walking. The shoes are sturdy and have inner cushioning that make them comfortable. Apart from this, their leather uppers offer protection. The insole is lined with nylon and is removable. Two Velcro straps at the top make the shoes easy to wear and remove. The Propet men’s sneaker protects the feet from shocks thanks to its fully padded foot bed. Its outsole rubber is non-slip and does not trip. On the upper side, the shoes have perforations that allow air to reach the feet. Therefore, the feet won’t heat up and start sweating profusely when wearing the shoes for a long time. The Propet men’s shoes has great reviews from customers that have bought them at Amazon. 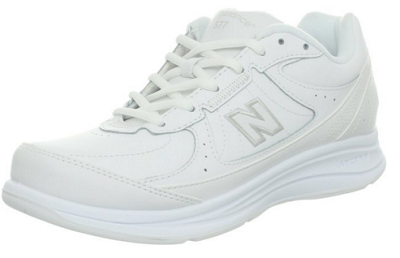 The impressive reviews make this one of the best Velcro shoes for elderly men. The MW57 Leather Walking Shoes is another pair of best Velcro shoes for elderly men. The shoes are made by New Balance and have a durable man-made sole. On top, there are two Velcro fasteners while the upper side is made of leather with ANZORB cushioning. The midsole is made of polyurethane. The shoes have a Walking Strike Path outsole that helps seniors stay balanced while walking. The shoes are breathable thanks to the perforation of the upper leather. Therefore, you can be sure the legs will be comfortable even when wearing the shoes for a long time. The MW577 Leather Walking Shoes also have arch support. This is another reason why they are on the list of the best shoes for seniors. Customers who’ve bought the MW577 Walking shoes are happy with their performance, quality and comfortable. The shoes are praised for their quality and durability. These Velcro shoes for women are the female version of New Balance’s men’s walking shoes. The shoes is similar to the men’s in all aspects apart from the shape, which is distinctly feminine. The women’s shoes are made of leather, have an AMZORB heel and a rubber sole. All the features of the men’s shoe are also available in the WW577. This is one of the best shoes for elderly women. When you check reviews of the New Balance women’s shoes on Amazon, it is clear many people love them. The shoes are highly rated for their great fit, stability and comfort. While these shoes are not exactly the women’s version of the men’s Propet sneaker reviewed above, they also have various features that make them comfortable. The elderly women’s shoes are made of leather and feature two adjustable Velcro straps on top. The upper side is made of leather while the bottom areas is rubber. The rubber bottom has good traction and provides balance when walking to prevent falls. The insoles are cushion-padded for comfort at the heel and toe bed. This makes this Propet one of the best shoes for senior women with arthritis or swollen feet. Reviews of Propet women’s shoes on Amazon show it is comfortable, durable and ensures the stability of the wearer. These are some of the reason why the Propet rates one of the the best shoes for elderly women.